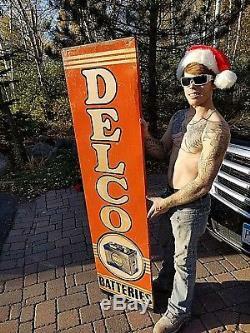 On the front of the sign there is the large wording Delco going vertical through the center. 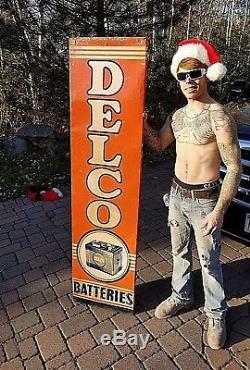 At the bottom of the sign, there is the wording of "Batteries". In the lower center of the sign there is the graphic of a battery. In the lower right corner of the sign there is the smaller fine print wording of Donasco 56. On the back of the sign there is a wood frame. 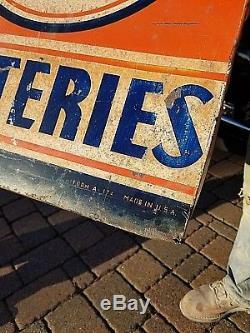 This great sign is in nice condition for its age, overall still a nice sign for the collection The sign measures about 70 inches tall and 18.5 inches wide. If you collect signs, gas and oil signs, cans, gas pumps, lubster, Gulf, Valvoline, Mobil, Standard, Texaco, Willard, Ac Delco, Service Station Advertising Display rack, BFGoodrich, Exide Batteries, etc, Add this nice piece to your collection. I can accept Pay Pal. Check out the other items I have listed. 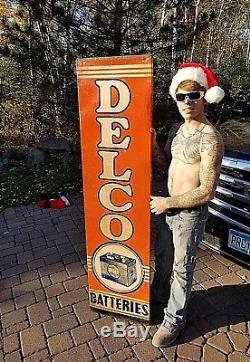 The item "Vintage 1956 Vertical Delco Batteries Metal Sign Gas gasoline Oil 70X19" is in sale since Sunday, November 4, 2018. This item is in the category "Collectibles\Advertising\Merchandise & Memorabilia\Signs\Original\1930-69". The seller is "badboyz1" and is located in Milaca, Minnesota. This item can be shipped to North, South, or Latin America, all countries in Europe, all countries in continental Asia, Australia, New Zealand.